Exposed wood chairs are a great way to accent your home with a fresh cottage style. Renowned for their auras of delicate charm, upholstered chairs like this can dignify an entire room setting. Smooth finished wood wraps around this piece creating looks of professionalism and sophisticated elegance. 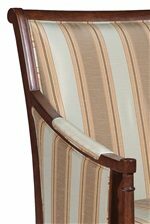 Met by fine fabric upholstery replicated in small accent arm rests, this chair is an extraordinary creation of clean cottage style. The 5719 Unadorned Accent Chair by Fairfield at Belfort Furniture in the Washington DC, Northern Virginia, Maryland and Fairfax VA area. Product availability may vary. Contact us for the most current availability on this product. This sophisticated accent collection creates a cross between casual professionalism and quaint cottage style. An unadorned settee and comfortable accent chair give this collection a delicate look that achieves superior eclectic style. While smooth finished wood creates clean looking angles, complimentary upholstery gives looks of comfortable charm. Perfect for sitting rooms, parlors and porches, this living room furniture collection will complete your traditional or cottage styled atmosphere. 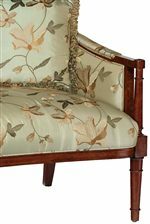 The 5719 collection is a great option if you are looking for Traditional furniture in the Washington DC, Northern Virginia, Maryland and Fairfax VA area.